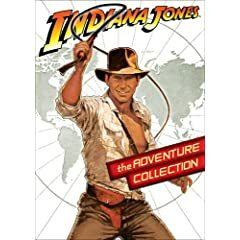 With the fourth installment of the Indiana Jones series, Indiana Jones and the Kingdom of the Crystal Skull, set for a theater release next week, Paramount is releasing a box set featuring the first three films in the series: Indiana Jones and the Raiders of the Lost Ark, Indiana Jones and the Temple of Doom, and Indiana Jones and the Last Crusade. These editions (also available separately) contain new interviews with the filmmakers as well as artwork from the original storyboards and documentaries. It's a good week for classic film fans, with the release of two Jean Luc Godard films, La Chinoise and Le Gai Savoir. The Criterion Collection releases two essential Lousi Malle films, The Lovers and The Fire Within. Among the week's television DVDs, Cartoon Network's Shin Chan: Season 1, Part 1 is the release I am picking up and the third season of Saturday Night Live will appeal to fans of the earlier incarnation of the show. Music releases skew towards classic rock, with Pink Floyd: Welcome to the Machine and two Led Zeppelin films: Celebration Day: The Inside Story of Led Zeppelin and Led Zeppelin: The Making of a Supergroup. Can you recommend any of these DVDs? What should I avoid?